I’m tired of being good. It’s time to be deliciously free. How I wish I could say that without rushing in to assure you that I promise I’ll still be good. The truth is, I worry. Less than I used to, but still, I do. I’ve probably had every kind of worry you could imagine. There’s the kind about things that haven’t happened yet, things that didn’t but very nearly could have, things that are highly unlikely if not impossible, things that are commonplace; I’ve worried about the things I want and the things I don’t, the purpose and the impermanence of life. Underneath, they all seem to stem from the same big fear that I am not good enough. This worry manifests itself as indecision, overthinking, holding grudges, and comparison. My expectations and criticisms originate there. We all have the same twenty-four hours, so what’s your excuse? Hustle! No pain, no gain! Stop playing small. Take massive action, go all-in. They’re crushing it, why aren’t you? The steps to success are quick, easy, and proven. Do whatever it takes. You miss 100 percent of the shots you don’t take. The universe loves speed. #YOLO. I’ve spent a lot of time and mental energy on what I thought was self-improvement. Now, I’m seeing it for what it really was: self-medicating. The pressure to always be moving, always be achieving, faster, faster, hurry up and keep up was an addiction. This addiction was a symptom of losing trust in my own worth. I thought for a while that my worries were about control, but now I’m seeing that control was never the problem. I thought maybe it was perfection I sought. That wasn’t it, either. This was never really about success or approval, and certainly not improvement. What I’ve been seeking all along is freedom, and that’s what scared me the most. My indecision wasn’t about the decision itself, it was about the act of deciding freely. Staying in relationships even though they hurt me wasn’t about the love or the loss, it was about the act of choosing myself, freely. Underneath every fear, every worry, every grudge and comparison was doubt in who I am, what I’m worth, and what right I had to take up the time and space to figure this out. And now that I see things more clearly, I am clear about what I truly want. I want liberation. I want to free myself from the ghosts of the past and fears of the future. I long to be free from shame and the barriers I’ve built against my own peace. I want to use my voice freely and heal my steadfast heart. I want to freely and lovingly inhabit this body that’s stood by me no matter how much I’ve abused it. I want to rise up, thank the day, and carry on. Freely. Even as I’m writing these words to you, I’m learning what I need to do to stop the cycle. I need to practice making difference choices and voicing different beliefs: Time is not money, it’s medicine. I need not be so disciplined but discerning. Not productive but perceptive. Oh, and I feel the resistance to this. The resistance is withdrawal, and it’s evidence that I’m recovering. But even with this insight, the fear of the unknown and the craving of familiarity are still there. Who will I become if I were truly free? What value will I have? Each time I set myself free, I will fly back to my cage until I trust the process of healing and love myself unconditionally. This is the painful part about finding and expressing yourself that no one really talks about. Loving yourself and trusting fully in your inherent worth is risky. You will surely fail at your previous rules and fall short of your old expectations as you explore new, more open ways of being. Someone is bound to be disappointed when you start existing as yourself, for yourself. The people who thought they knew you when you were only a fraction of yourself will say you’ve changed. They may not know what to do with you anymore. There may be judgment and misunderstanding. There may be rejection. You may feel lost. You may get less done, things may take longer, your work may be less popular or less profitable. And there will be the trappings of who you said you were everywhere. I still have a drawer full of makeup and hair products, perfume, and high heels that I will never use again. Maybe it’s time to let that version of me go. As you move closer to freedom, the ghost of who you tried to be will linger, haunting you. It will show up as a craving for likes and shares, for affirmation from someone else of your worth. Little by little, as you shed the security blankets put down over the years, you will move away from the conditions of your worth. Through forgiveness, setting and enforcing boundaries, more authentic yes’s and no’s, and growing more clear in what you want and where your true priorities lie, you will find new depths of freedom and space. It will be empowering and terrifying. What I’m discovering now is that you need to meet these challenges with grace and compassion. Letting go gives you space, but it needs space, too. Space brings solace. Space allows expansion. If you need to, stabilize. Seek freedom and familiarity consciously. And then carry on, consciously. Have the courage to ride the cravings out. Resist the habit of proving your worth and earning your freedom. The doubts will try to convince you that they’re making you better, more worthy. Remember that it never worked that way before. I’m seeing now that what I do or don’t do, how far I do or don’t go, what I do or don’t achieve has never been the question. The question is, what frees me? I may not know what my freedom holds, and I may still face that uncertainty with some degree of fear, but I’m learning to trust that the pins and needles of waking up are the cure to what’s really ailing me. The greatest opportunities are not found in safety or certainty. Just as in facing any fear, the old beliefs about your worth need to be threatened in order to be changed. Each time we practice asking ourselves what will set us free, we’ll learn to speak the language of our intuition that much more fluently. Each time we practice validating our own perspective, we’ll learn to distinguish between wisdom and sound bites that much more naturally. One layer at a time, we will build a foundation of trust in ourselves and our inherent worth, and I have to believe that this will set us free. 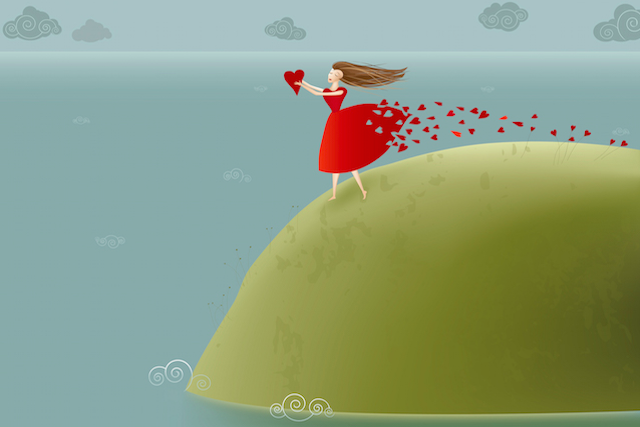 The post Loving Yourself When You’re Addicted to Self-Improvement appeared first on Tiny Buddha.